Choosing a wedding photographer is a tough choice for any bride. The process requires a lot of research and resources through multiple mediums, but how are brides really finding their wedding photographer? Below are the top 4 methods brides are using to find and research the photographer that will capture their special day. The majority of brides find their wedding photographer from major search engines such as Google, Yahoo and Bing. With Google making up close to 80% of the search market (Yahoo and Bing being about 8% a each of the search market) and receiving about 400 million worldwide queries a day, Google is the number one place where brides are finding their wedding photographer. This means, that photographers must place some effort to rank within the local search results. To accomplish this feat and rank high on the local search level for such queries such as “professional photographer”, “wedding photographer” and “professional photographer for a wedding” a photographer must learn and implement Search Engine Optimization tactics to appear on the first page of Google. In general, the majority of people will only click on the first 5 results that result of entering a query into Googles search engine, so being on the first page is key to success in a region for photographers. In the following month DigiLabs will be coming out with a great blog post on how photographers can gain more clientele from Google. With wedding photos going viral on a consistent basis in Pinterest and Facebook, social media is one of the most powerful tools for getting in front of a large amount of potential brides in little time. Sharing stunning and unique photos of a recent wedding, engagement or even an artistic photo shoot and posting them to a social media outlet can get your photography studio in front of thousands of brides, so when time comes to choose a wedding photographer, they have your studio or that great photo in mind. The Takeaway: at least once a day, post photos from previous shoots to keep your Facebook followers interested and engaged. There are some negative aspects to social media marketing that photographers should know about. Even though a photographers photo may be able to reach hundreds to thousands of people in a short span, the chance of reaching the correct demographic in targeted geographical location is quite slim. But getting those shares and likes on Facebook and Pinterest are still a great thing for Search Engine Optimization. Another negative of course is having many people stealing your work. There have been numerous amount photographers photos being stolen or not appropriately credited once it hits the social media world. Tip: Always use a watermark before you send your great photos to Facebook and Pinterest. Possibly one of the best ways that brides are finding their wedding photographer is through word of mouth. When brides have a great experience with a photographer they can’t wait to talk about it or show their photos to friends and family. But having a chorus of brides singing your studio name takes effort on the photographers behalf. Besides giving your bride great photos, give them the tools to spread your name to friends and family is key. Promotional cards, consistent weekly emails, a studio Yelp and Google review pages ect… are all means where brides can tell the world about your great photography. Tip: it’s a matter of always being consistently engaged with your clients before and after the wedding to maintain brand/photographer awareness . There are large wedding directories that help brides find their photographer with ease. 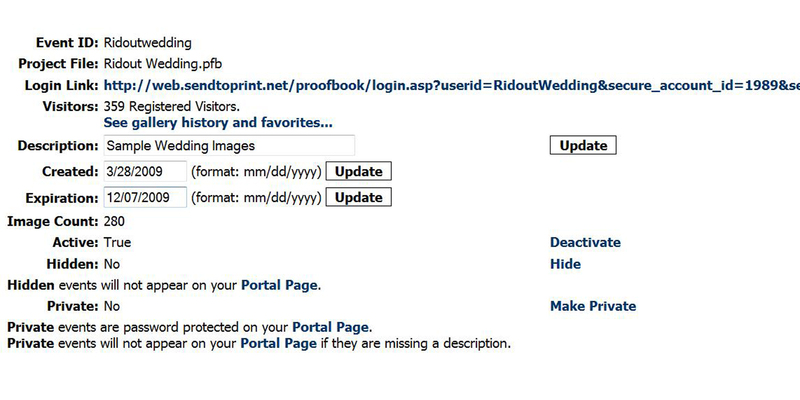 Weddingwire and Snapknot are easily the biggest wedding directories that brides use to find their wedding photographer. They both have free basic membership plans for photographers and wedding vendors, but also have higher membership programs as well. Both of these platforms are used for brides and grooms to seek out potential photographers within their local area. Snapknot has a great feature where brides can find their photographers on price as well. Both websites allow for photographer to upload their photos, studio information and other options so that clients can get to know much about your studio without even touching your website. Lastly, both websites have the capability for user reviews, which can seal the deal for new brides that are interesting in your service. This entry was posted in Marketing and tagged directories, reviews, search engine optimization, social-media, wedding photography on December 11, 2013 by digilabsprowp. As the wedding season really gears up I thought it would be helpful to do a post on building client relationships. Client relationships are important to build customer retention and bridging customers from one product to other products…Oh and let’s not forget providing excellent customer service. Gosh, this sounds an awful lot like my role as account manager here at DigiLabs! In the end by implementing stellar customer service in your studio you will set your business apart and keep your clients coming back. Okay, I don’t expect you to run off and hire me immediately (Editors note: I would like to mention Kate is not for sale) but I do suggest considering ways to make your customer’s connect with you and your studio. Obviously taking superb photos is important, but what can do to go above and beyond the average photographer? You want to make your customer feel special, so why not send them a personalized gift as a thank you for booking with you? You don’t have to spend an arm and a leg to do this. Here are some creative gift ideas that will make them remember you when their friends get married or better yet, for their family portrait, baby photos and on….And they won’t break the bank. I’ve kept all my ideas UNDER $20. Use one of your spectacular images and create press printed cards. I suggest doing postcards because I think they are more stylish, it requires less postage and is less expensive for you. Create a pack for your bride and groom and they are sure to order 5 more to thank their guests for coming. Also, add your logo subtly with your URL and you’ve got yourself some direct (snail mail) marketing. 2. The killer wedding play list: I love this idea because it is so incredibly easy and can be mass produced for all your couples or picked with love for each and every booking. Your couple will enjoy it because it will really get them in the mood for their big day. You can even customize each couple with their song as the last track. 3. Personalized Calendar: Not only is this easy to make but it is extremely practical. For under $20 you can make an amazing calendar for your bride & groom to remember their first year. DigiLabs’ fast track feature in our software can help you make the calendar in minutes. Just add your art, your logo and any personalized text. Not only will they appreciate this work of art, showcase it on their office wall (with your name and number handy), but they will be reminded of what a good job you did every day! 4. Monogrammed tote bags: These are easy and fun and can be personalized with the couples name or initials. You can even add your logo! I found this amazing post on a DIY project if you’re that kind of person or you can buy online for the MULTITUDE of vendors out there. It is also a great packaging idea – just put their finished album, proof magazine or high-resolution disc in their new personalized bag. 5. Emergency Bridal Kit: This is something you could present as soon as a bride signs up with you or present it to her on her wedding day. It is really thoughtful and could be a lifesaver. You can buy online or make your own! So now you see, it’s not that hard or expensive to connect with your clients or make them feel special. Do you have some ideas? Post in the comments and share! This entry was posted in Marketing and tagged Calendars, cards, DigiLabs Pro Software, Marketing, Revenue, word to the wise on May 25, 2010 by DigiLabs Pro Blogger. I debated for a long time on my topic. I wanted to give you something that is both interesting and informative. I mean I can always write about Jesse James (Sandra Bullock’s husband) and how he has influenced the DigiLabs team to create a new line of coffee table books – The Break Up Book. Let me remind you, all rights reserved on this brilliant one. Don’t even think about stealing this idea! Think about it, people break up more times in their lives then get married… Okay enough of my entrepreneurial ideas. Let’s talk about something that can actually help you with your business. With the economy being down I have had many photographers ask me, “How can I book more weddings this season?” Instead of telling you a plan of action, which I am sure you all have already done yourself, I would like address this question by sharing some optimistic thoughts and inspirational ideas. A. Show her the love. Send a celebratory, note or email. If you feel comfortable, send them a cupcake, or grab some dinner together. Get to know your client and see find out what they are looking for from you both professionally or personally. Show them that you care about them and that it will be fun to spend their special day together. B. Be your bride’s helper. Find out if she needs referrals to help her with wedding planning. Every bride is overwhelmed by the amount of planning and she will be very happy with any good referrals you send her direction. Also this will help you develop a relationship with vendors that can bring you future work. C. Show her that you get her style. Give her some ideas of what you should do for the photo shoot. Share with her specific images that you think will fit her style and allow her to see herself in your images. Bottom line, do something that will help you connect to each other (and put everyone at ease) and let them know you’re there to work your hard for them. From that point on, it will not be all about how much you charge and if they found someone else that is a few hundred dollars cheaper – it will be about your connection, artistic vision and natural enthusiasm. By being yourself your clients will feel inspired by your energy allowing them to be open and genuine with you. Be yourself. Create a connection. Always be innovative, always try new things, and always improve yourself as an artist. Don’t expect to raise pricing without putting in some hard work. Find clients that fit with your style and pricing model. If you target the wrong type of customers you are likely to hear, “but so and so would do it for way cheaper” or “I cannot afford it”. If you have decided to increase your pricing, make sure your look into new markets to find a more ideal client. Whether you are charging $1000, $3,000, $5,000, or $10,000, if you want to book weddings, you must consider where your target audience is. Ask yourself, WHO IS MY IDEAL CUSTOMER? Once you have isolated your ideal target customer find out about what they like and market to them. Where do they hang out? Where do they shop? Where would they start their planning? What attracts them to one website instead of the other? What types of vendors do they prefer? Do some serious brainstorming and get to know your target audience (no stalking please). Ok, I know you’re wondering HOW can you do all of this? Well, let me give you some ideas. Network with some of your fellow photographers. On the surface this seems like a bad idea. You might be asking, “How would spending my time hanging out with my competitors can actually help me?!?!? “ News Flash: Many times photographers get inquiries that they cannot take, either because they have another event that day or because they are busy. If you happen to be friends with these photographers, and they like your work, they might actually pass the job on to you. Also, photographers often need second shooters and this can be a great way to make money, build your portfolio and learn new techniques. Network with your local vendors. I think a lot of photographers KNOW this but don’t actually DO this. Referrals are a main revenue generator in our industry (both with your clients and local vendors). Photography is a gift – so use that gift to promote yourself! Every vendor needs images to present their services. Flower shops need to show future brides options for arrangements, wedding planners have to show brides photos of their previous events, jewelry stores need images of their engagement rings for their website… this is a great opportunity for a bargain. You will promote them by providing services they need and would otherwise pay for, and they promote you by displaying your work at their locations and sending clients your way. I hope all you found some gems for marketing your photography business. We are gearing up for a great wedding season this year. Get out there, be optimistic, be fierce and most importantly be yourself. This entry was posted in Marketing and tagged brand ideas, Professional Photographers on April 2, 2010 by DigiLabs Pro Blogger. Digilabs can help you make more money ONLINE this holiday season. Activate your inactive galleries throughout NOVEMBER & DECEMBER for FREE*. Market to your customers to grow your online sales this holiday season! 1. REPOST GALLERIES: Login to your account administration and click view galleries. Find the galleries you would like to repost and click view details. Change the gallery’s expiration date to the date you’d like it to expire (no later than 12/31/09 to qualify for this promotion), press update and your galleries will reactivate! Marketing Tip: We have found that running a two week special seems to drive more sales. It gives people time to order and drives a sense of urgency to your customers. Since the last day to receive online print orders for holiday delivery is December 11th we suggest running your special before this date. 2. CREATE COMPELLING OFFERS: We all love a good holiday deal. Get your clients to ORDER MORE by offering a special holiday discount. Login to your account administration & click discounts & credits. 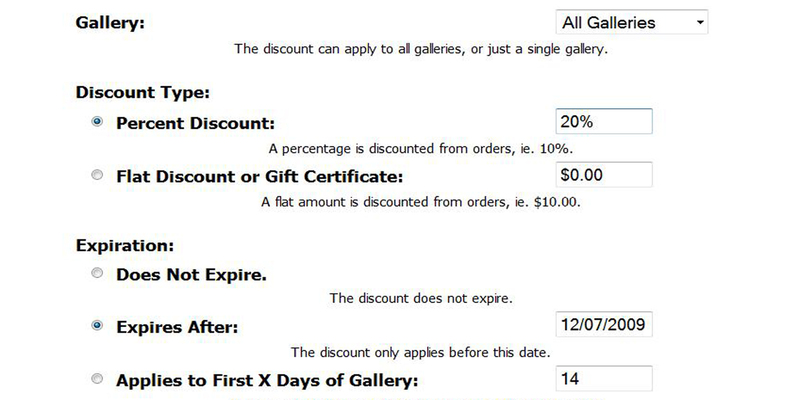 Create a discount that will apply to ALL galleries and expires before your galleries are set to expire. Keep it simple with 20% off or create a more creative discount offering 50% off $200 or more in ordering. Either way, give your clients an incentive to order! Marketing tip: Don’t forget you can offer custom single photo items in your online offering! Read more about these features or see a sample. Our most successful studios are offering holiday greeting cards & high resolution images for sale. You can also offer custom non single photo items for sale as well like books, gift certificates, and more! 3. SPREAD THE WORD: Now it’s time for some simple promotion. If force login or sign in registry features are enabled, go to gallery marketing to collect ALL email addresses for a given gallery, or just compile all of your client email addresses. Send an email to your clients with the promotional information and a link to the gallery. Marketing Tip: Try using an inexpensive email marketing company (get on a 30 day free trial & use just for the holidays!) to make a template with your branding. We suggest doing 3 emails during the 2 week promotion. 1. When the promotion begins, 2. Reminder email one week later and 3. Final email the last day or two reminding them that promotion is ending. subject: Tis the Season for Cards & Prints! body: In the great spirit of the Holiday Season YOUR STUDIO NAME is offering a special holiday discount for EVENT DESCRIPTION! Get 20% off all online orders placed from November 23rd to December 3rd! Give high quality personalized photo gifts that your friends & family are SURE to love. Or, use your pictures to create unique holiday cards this season. Take a peek & don’t miss out on our Holiday savings. Click HERE (direct link to gallery) and take care of all your holiday shopping! And there you are! Feel free to contact us with comments, questions or inspirational marketing ideas. Here is to a profitable holiday season! This entry was posted in Marketing and tagged digilabspro clients, increase sales, Professional Photographers on November 4, 2009 by DigiLabs Pro Blogger. Last week I grabbed lunch at my favorite grocery spot in Palo Alto & saw a FULL ON PUMPKIN DISPLAY! Through my shock I thought to myself: HOLY MOLY, is it fall already!?! Well to answer my own question, YES, IT’S FALL…we’re already into the 2nd week of October! And if it’s Fall already you know what that means?…the Holidays are right around the bend! Apparently my seasonal clock is all off because it seems like alot of my Photographers are hunkering down for the quickly approaching holiday season! Which in turn means that a new year is upon us, some would even say a new CALENDAR year! Speaking of calendars (smooth transition wasn’t it? ), what do we know about calendars? 2. This calendar is going to be viewed regularly throughout this year. Its like a 12 year billboard! 2. You take pictures, people who probably would be SMITTEN with a calendar STARRING THEM! So let’s spell it out! 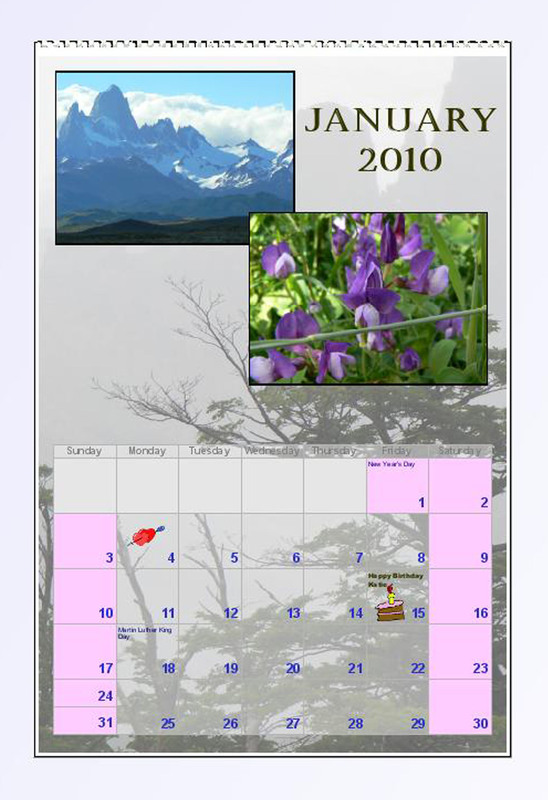 Why not offer your customers custom photo calendars? Oh wait let me rephrase: Why not offer your customers custom photo calendars through Digilabs? Our free drag & drop software makes it incredibly easy to quickly create a fully customized calendar for your customer! For your weddings, why not offer a calendar as a free gift to thank the lovely couple? You can add your logo & studio information to every month & start & stop on any month. If you Bride recently got married she is SURE to brag to all her girls about this cool addon! Or, for your family sessions offer calendars with their sessions instead of just greeting cards! They are sure to prefer their family images over some stock calendar of Hannah Montana or Monet’s Waterlilies & you can include all their significant events like birthdays & anniversary! They’ll be sure to do it next year! Also, why not create a Studio calendar of your proudest work & offer to your partners (like hotels, caterers, etc) with your info handy whenever they might need you throughout the year? Boudoir sessions are also a PREFECT fit for offering calendars! That’s just the TIP of the ICEBERG…bottom line calendars are inexpensive, easy to design & a necessity to the everyday person! Digilabs offers free software, quick turn around, high quality & everyday low prices AND are here to help! You can also add Calendars into your ecommerce web services with the new features we added last month! You can add this into your ecommerce section under Custom (Non-single-photo) Products. To see a sample of how we did this click HERE. Enter the gallery & click on products on the upper right hand corner! I can start & stop on any month, I can choose what day the week should start on & even select any holidays that would apply to my customer! Call me a show off but I took a couple screen shots to show just HOW SNAZZY My Calendar & Cards software really is! We offer 5 different sizes and have over a dozen templates to choose from. There also is the ability to add unlimited custom events (anniversarys, birthdays, family gatherings, etc etc) & we offer 35 national and religious holidays. The possibilities are endless! Also here is a little peek into my January page for my calendar. 1. I’ve added multiple pictures including 1 that was used full bleed on my background. I could control the border, opacity & even order & rotation. 2. I can add text anywhere I want. You can even add your studio name & logo to every page! Our calendars are printed on 100# cardstock & wire-o bound so they’ll lay nicely against your or your customer’s walls. You can take a peek at different sizing & pricing HERE. Also starting Friday 10/9/09 we’ll be offering 10% off & FREE shipping on all card & calendar orders until 11/2/09! * Keep an eye out for the coupon ID & beat the holiday rush! Let us know if you have ANY questions! This entry was posted in Marketing and tagged Calendars, increase sales, professional photography on October 8, 2009 by DigiLabs Pro Blogger.